Dunyvaig Castle, Dun Naomhaig, is best known as the naval fortress of the Lords of the Isles, the chiefs of the Clan MacDonald. But it has a much longer history, both earlier and later than that remarkable period of Islay’s past. Not just Islay’s past, but also that of the Western Atlantic Seaboard and indeed much further afield. Dunyvaig is, arguably, the most important of the historical monuments on Islay, and also one of the most striking to visit in its remarkable setting of Lagavulin Bay – quite thrilling whether in the sun under a blue sky or in a gale when the waves are crashing against its walls. But what do we really know about the castle? When was it first built and why in this location? Who lived and worked in and around the castle? How did it gain its food and fuel, how did it influence peoples’ lives throughout Islay, and how was it influenced by the dramatic climate changes of the middle ages? These were some of the questions addressed in the Dunyvaig Academic Workshop hosted by Islay Heritage and held at Lagavulin distillery and the ICCI on the 13/14 October 2017. A group of distinguished archaeologists and historians from the Universities of Stirling, Ulster, Queen’s University Belfast, Historic Environment Scotland and the Society of Antiquaries of Scotland joined the trustees of Islay Heritage and local historians for a weekend of discussion and debate as the first stage in planning Islay Heritage’s Dunyvaig Project. Visiting academics from Edinburgh, Stirling, Ulster, and Belfast, Islay Heritage Trustees, local historian, and Lagavulin representatives visiting Dunyvaig Castle during the workshop. 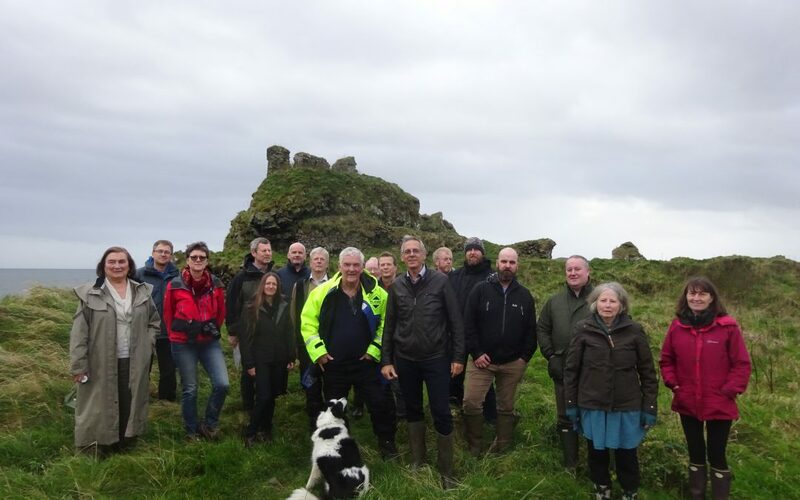 The Dunyvaig Project’s aim is not only to start excavating Dunyvaig Castle in the summer of 2018, but to also explore its surroundings and its environment as a major research project for Islay and for Scotland; not just a research project for academics, but as a community project for the residents and visitors to Islay. There will be an opportunity to join an excavation, gain training in archaeological techniques, help process the finds and contribute ideas to their interpretation. 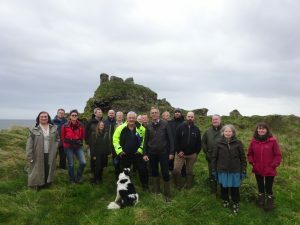 The project aims to collate all the stories, images, poems and songs about Dunyvaig – and the memories of those who have visited the castle over many years. The Dunyviag Project remains at an early stage of planning. There are hurdles to cross to secure permission from Historic Environment Scotland for the excavation (Dunyvaig is a scheduled monument) and a great deal of tasks to undertake before the excavation can begin. The most important next step is for Islay Heritage to gather the views of the Islay community readers of the Ileach as to what they would like to learn about Dunyvaig and how they might wish to participate in the project. Please start by sending these to info@islayheritage.org and watch this space for the announcement of the next Dunyvaig meeting. The workshop and the future Dunyvaig project have been made possible by a donation to Islay Heritage from the Lagavulin 200th Anniversary Legacy fund. The distillery provided generous support to the workshop. The Islay Heritage Trust planning the Dunyvaig Project. 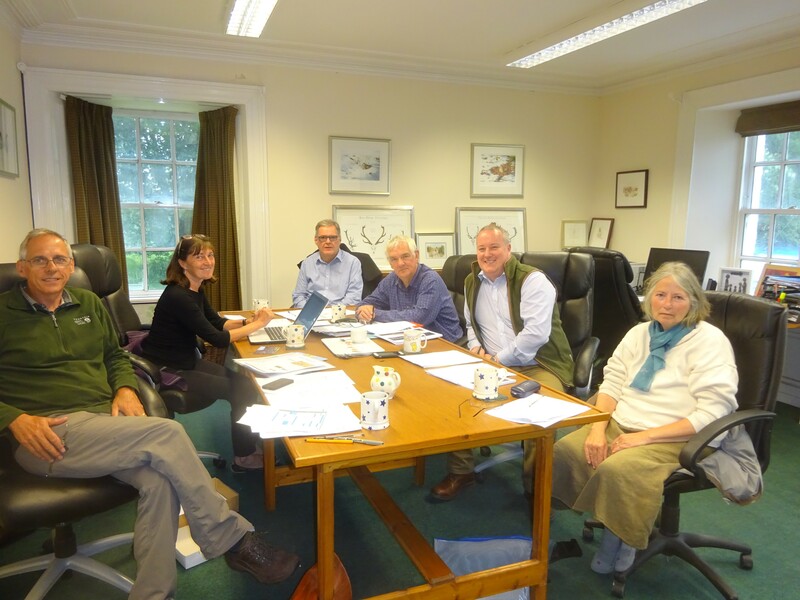 From right to left: Susan Campbell, David Gillies, Les Wilson, Neil Woodrow, Susan Mithen, Steven Mithen.